We did manage to get a few days in this past May and that started out with a great day at Kalamazoo. 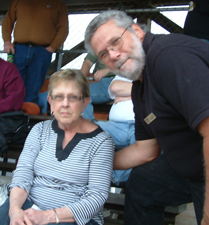 Al Peltier took care of Kalamazoo Speedway on May 1st for the club and was able to present the MARFC Helmet bag to longtime Kalamazoo Speedway supporter and fan, Nancy Walker. 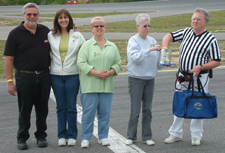 Nancy has severe back problems yet she is there every week supporting the track and the racers in spite of the pain. Congratulations Nancy. Our MARFC member raffle was won by Bob Town. A big Thank You to Gary and Donna Howe for having the club out on a great night of racing. 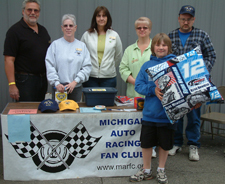 On the 15th we had Al Peltier, Sue Ginter, Cory and Steve Russell, and Laura Tucker, as well as Larry & Kenny Letts help out at the membership table at the Auto City Speedway. 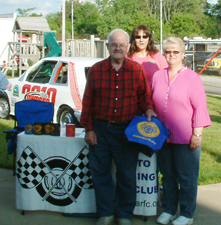 The MARFC helmet bag was given to Rusty Daggett in recognition of his over 40 years of service to the speedway. Young Randy Kinne was the MARFC member raffle prize winner. I want to say “Thank You” to Joe DeWitte and Sharon Fischer for having the club out to this great facility. 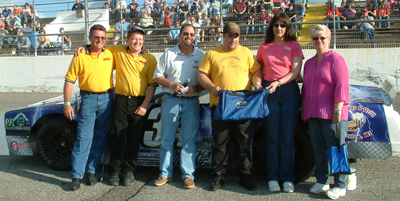 After a rain-out and a quick re-scheduling we were able to get the show in at the Owosso Speedway on May 22nd. I do apologize if you missed it but we did try with e-mail and internet to reach as many as possible. It was a glorious night for racing and thanks to table helpers Laura Tucker, Sue Ginter and Steve and Cory Russell. Our Helmet Bag went to Pro Stock driver Eric Olson and the winner of our MARFC Member raffle prize was Jack Colpean Sr. Another big Thank you goes out to Rick & Jennie Miracle and Jeff & Pam Parrish for having the club out to this historic racing venue.